The Hlookup function looks for a value in the top row of a table and then returns a value in the same column from a row you specify. HLOOKUP is just like the VLOOKUP formula. It's just the rows and columns being switched. 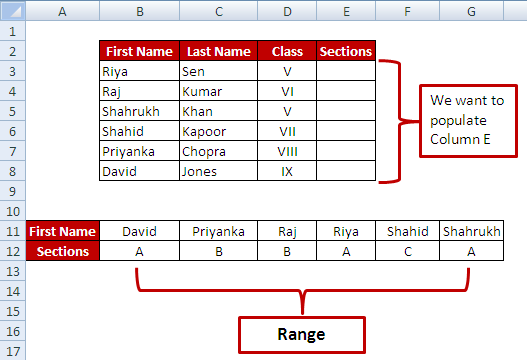 lookup_value - It is the value to be found in the top row of the table. table_array - It is a table of text, numbers or logical values. Table_array can be a cell reference or a range name. row_index_num - It is the row number in table_array from which the matching value should be returned. Note : If you don't enter a value in the fourth parameter "range_lookup" of hlookup, excel will consider 1 as a logical value i.e. closest match. Suppose you have data for students' names and their classes. You want to find the section names for students in data table. Download the workbook used in the examples shown below and practice what you learn. 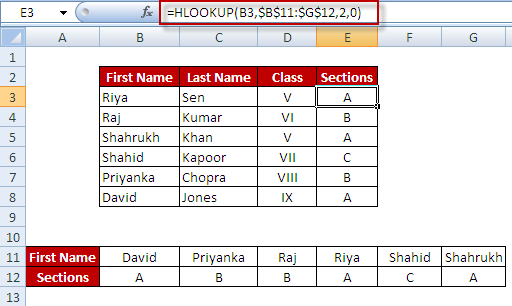 To make HLOOKUP work, you need to have a lookup value in the first row of the table. If your look up value is not placed in the first row of the table, it will return #N/A error. 0 Response to "HLOOKUP Function and Its Uses"